Will Control Over Part Data Expand and Simplify AM Supply Chains? Blog Post: 3/30/2018 – Digital rights management for manufactured part files will enable OEMs to enforce manufacturing requirements at a distance, potentially providing an alternative to closely held relationships with suppliers of critical AM parts. 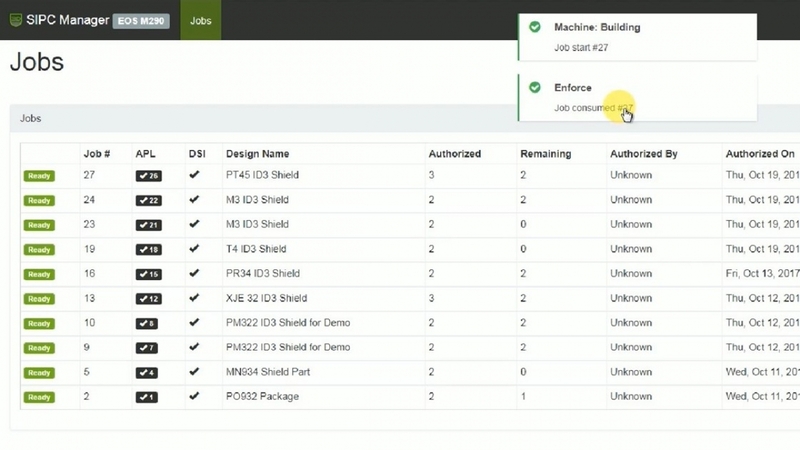 Screen capture taken from this video demonstration of Identify3D illustrates control over the part quantity produced. In this view from the perspective of the supplier receiving the part file, Job Number 27 (at the top of the list) is authorized for only three builds, and has further been restricted for building only on an M290 machine. The part here has just been sent to such a machine, leaving two allowable builds in the Remaining column. Does the music industry have a lesson to teach additive manufacturing? Stephan Thomas says yes, and the lesson is partly a cautionary tale. The music industry lost more than half its value after the onset of free digital sharing of music around 2000. Only when the industry found platforms for sharing data but also keeping that data secure (Spotify, for example) did its sales begin to grow again. Mr. Thomas is co-founder of a company, Identify3D, that aims to bring the same kind of data security to manufacturing. The risks of unsecured data apply to any process based on a CAD file. But additive manufacturing is a particularly important area for file security, he notes. An effective additive manufacturing process for a given part is frequently the result of considerable trial and error, and some of the manufacturing process considerations discovered as a result (such as part orientation and support structure design) are directly apparent in the model. Therefore, in additive, the part file to be protected includes not just design details, but also intellectual property related to manufacturing. Suppliers of AM-related technology that have announced partnerships with Identify3D include EOS, Materialise, Renishaw and Siemens. The music analogy goes only so far, he says, because the peril in manufacturing is significantly greater. If a stolen music file is misused, only the listening experience will suffer. However, if a stolen part file is manufactured in ways that the originator of that file did not intend, it will result in not only lost revenue, but also lower-quality parts potentially finding their way into the supply chain. Today, the way that buyers of high-value parts guard against this danger today is through tightly controlled relationships with suppliers. Additive manufacturing suppliers, in particular, are kept close. The effort is costly and constraining. Identify3D offers what it expects buyers of AM parts will see as a liberating alternative: digital rights management that restricts not only the access to a CAD file, but also the manufacturing choices that can be associated with it. “Our vision is to be like PDF for manufacturing,” Mr. Thomas says, “essentially an easily usable standard available everywhere manufacturing is done.” Formerly with Ernst & Young, Mr. Thomas’s experience is in manufacturing supply chains. The company’s other co-founder, Joe Inkenbrandt, has a background in security and cryptography. Like a PDF file, a CAD file that is protected using Identify3D would be opened—and could only be opened—using a software utility at the receiving end. The utility can protect access, but it also does more than that. It enables the file’s originator to place manufacturing-related restrictions on the model. The number of parts the file can be used to produce can be limited. Restrictions can also control which type of machine is used to make the part (the demo referenced in the photo caption restricts the part to an EOS M290) as well the parameters of the build cycle. That is, details a sensitive OEM might control through direct qualification or certification can now be controlled remotely through software.